Last fall I was on Topsail Island, NC when my fellow museum-loving friend and I stumbled across the Missiles and More Museum. Despite the unappealing name of the museum, we decided to check it out, and we were so glad we did. 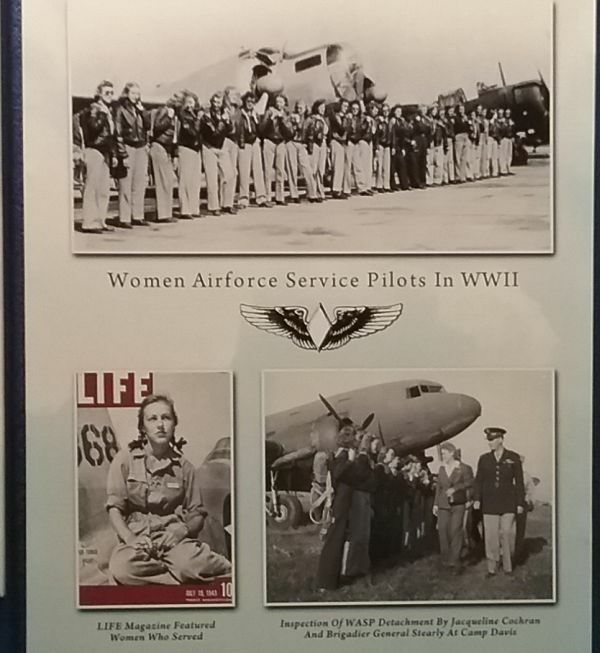 To me, the most interesting display was one on the Women Airforce Service Pilots, or WASPs. 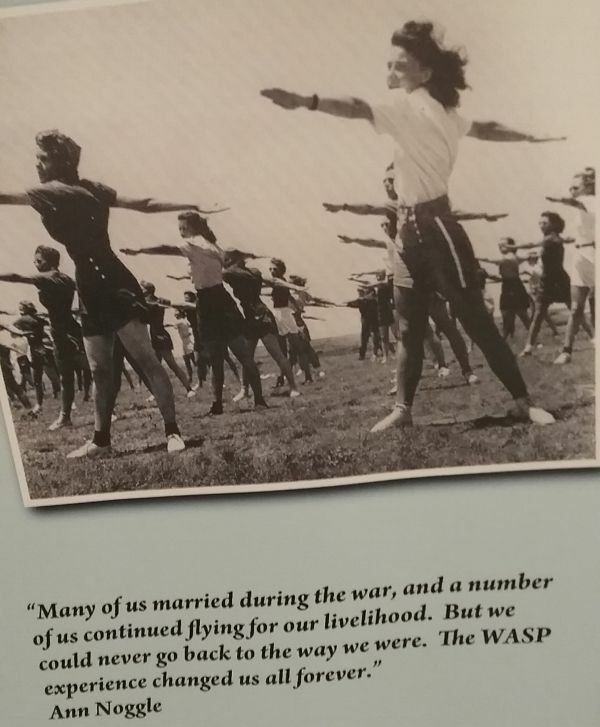 The exhibit was there because nearby Camp Davis was one of the 120 bases that utilized the services of the WASPs. The WASPs came about in 1943 because there was a shortage of male pilots. Women were recruited in an effort to free up men for combat flying, as the women were to do domestic, noncombat flying only. They ferried planes and military personal from place to place, and they towed targets used in artillery practice. 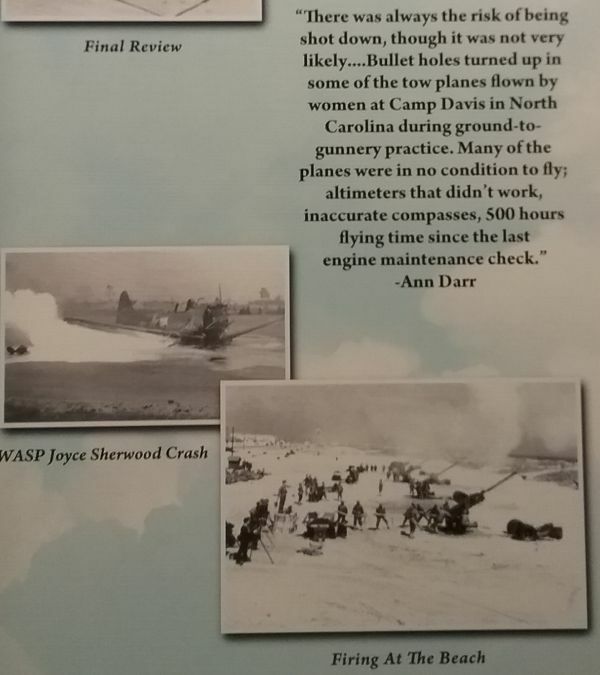 At Camp Davis the WASPs towed targets behind their planes as they flew over Topsail Island where men were learning how to shoot at a moving target. It was very dangerous work. Over the two and a half years the WASPs were activated, thirty-eight of them were killed. 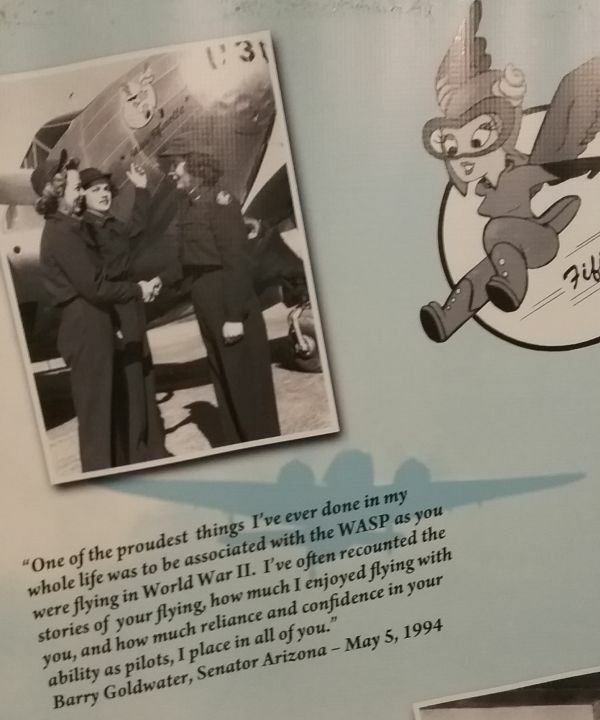 In order to become a WASP, a woman had to be between the ages of twenty-one and thirty-five (later lowered to eighteen and a half), be at least five feet tall, already have had flight training and be an experienced pilot. After the program was announced, over 25,000 women volunteered, but most were not qualified. 1,830 were accepted, with 1,074 actually finishing the training and becoming WASPs. Probably the most surprising thing I learned was that WASPs were not technically in the military. They had all the training an Army pilot had, wore uniforms, marched, and did daily calisthenics. They were military in everything except name. It meant that when the WASP was disbanded near the end of the war, the women were not entitled to any recognition or benefits. It was not until 1977 that President Jimmy Carter signed a bill sponsored by Senator Barry Goldwater that the WASP was recognized as a military division. 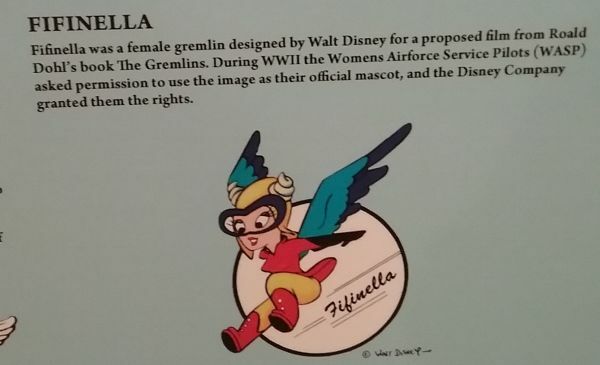 I love that the WASP had their own mascot, Fifinella. This was a product of the Walt Disney Studios, who supplied quite a few cartoon characters as military mascots. Today there is a National WASP World War II Museum in Sweetwater, Texas, where most of the WASPs received their training. Friend Lynn at AmericanAgeFashion sent their 2018 calendar to me. 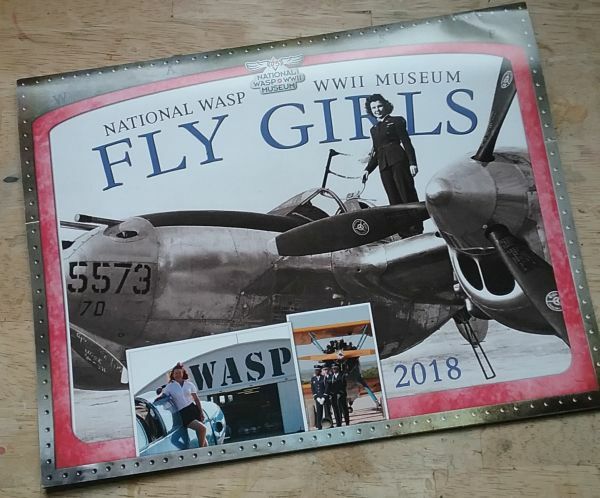 It’s full of both vintage photos of the women, and photos of the surviving WASPs today. This museum is definitely on my list of things I need to see. 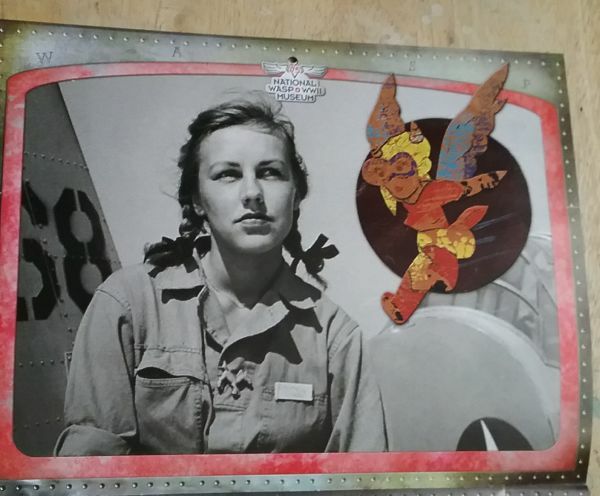 In the July 19th issue of 1943, Life magazine did a feature on the Women’s Flying Training Detachment, which a month later became part of the WASP. The cover girl was Shirley Slade of Chicago. (Love her little horse pin!) You can see this feature at Google books. Many of the most commonly seen photos of the WASPs came from this Life article. If you want to know more about the WASP, I suggest you listen to the two-part episode on Stuff You Missed in History Class. My husband just informed me his Aunt Alethea Pfaff (from Bogota, NJ) was a WASP. First time I am hearing this about family history! Interesting article you posted. I’m glad you enjoyed it. And thanks for adding Aunt Alethea’s name to the record! Thank you for this – very few citizens know -sadly most women- know anything about this. During the “Women’s Movement” in 1977 we (Woodward & Lothrop in DC) gave informal modeling-“Dress 4 Success” career clothes at the Pentagon. I was lucky to have met a WASP there. Made the “movement pale! You were lucky to have met her.It’s rather sad that the WASPs are just getting their due attention now that most of them are dead. 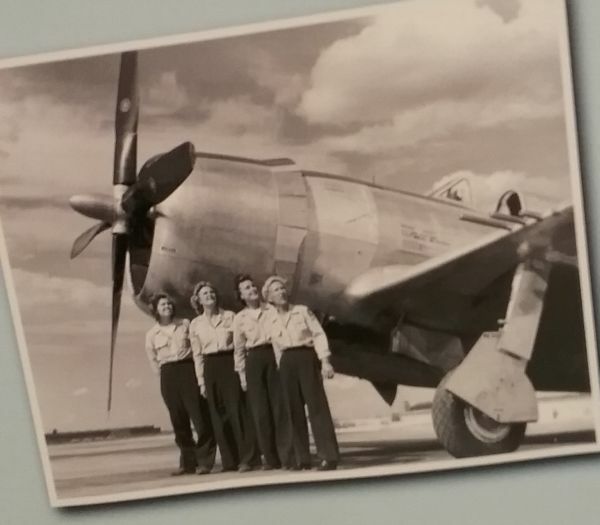 I don’t when and probably on PBS I’ve seen an interview with some of the women who flew. Mom was with the Marines and was an MP in DC during the war. These women wee amazing and had guts. Amazing is the word, that’s for sure. A woman who volunteered at my nonprofit office was a WASP – I only knew about this because she took time off to attend a reunion in the 90s. She was very concerned that they were represented and not forgotten. It was amazing to see the change wash over her talking about her experiences, she literally GREW in front of me, with her pride in her work (she’d learned to fly a crop duster so she flew alright) and her anger at their treatment during and after the war (the uniforms were an issue with her – not getting service in a shop or a diner). She’d come home and sat on that and shoved herself into a role she didn’t fit and resented. She paid for her own college, no GI bill, no insurance, and people had no idea what she’d done. At best, they assumed she’d been an office assistant or secretary (which is what she ended up doing for a career). I am grateful for her anger and her pride. I am honored I knew her. Thank you for the opportunity to remember her here. And thank you for sharing her story. I am angry for her, and the thousand others like her. I became OBSESSED with these women when I was in college. We had a really weird paper where we had to read this massive document and then pick a subject that was mentioned in it and write an entire paper on it. However, my professor felt the WASPs had too little mentioned in the document to merit an entire paper, so I ended up writing about the Monuments Men instead. However, after learning about them I fell down the history rabbit hole, and even became a member of the museum, even though I have yet to go! I am so glad you did this post! You are so welcome. I’ve got that museum on my list as well.